How can you use SEO to grow your small business? 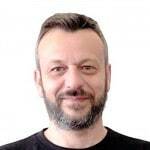 Can you do SEO on your own or you need to get expert help? What are the benefits of having a search engine optimized website and what does this means in business terms? These are just some of the questions business owners ask when it comes to small business SEO. I’ve talked with hundreds of small business owners that last 10 years and one of the characteristics common to all is that they are not sure how to approach SEO for their businesses. They know that SEO is the way to go, they know that their competitors are using SEO to get clients but they don’t know how to get started with SEO for their businesses. If you are in the same situation, don’t worry, you are not doing anything wrong. Running a small business is not an easy thing to do. As an owner you have to deal with some many things and if digital marketing or SEO is not something you are familiar with, things can get tricky. The purpose of this article is to fill in this cap i.e. to provide information to small business owners about SEO in simple terms and everyday language. What you will read below is how to approach SEO from an owner’s perspective and not from a technical point of view. You will learn what is SEO and how it can benefit your business, how to do SEO (either in-house or with the help of experts), and how to use SEO to get more clients to your door. The first thing that you should have clear in your mind is why you need SEO for your business. Search engines like Google, Yahoo and Bing are used by millions of people on a daily basis to find information, new products to buy, solutions to their problems and anything else you can image. I’m sure you have said many times the phrase ‘Google it’ when someone asks you a question and you don’t know the answer. All these daily searches create a huge market open to businesses who compete online. If you own a website, it is possible – under some conditions, to get a portion of these people to visit your website and turn them into potential customers by selling them your products or services. The conditions are simple, your website needs to appear in one of the top 5 positions (in the first page of the search engine results pages) for search keywords related to your business. According to studies, the majority of people (more than 70%) will click on one of the top 5 websites presented in the SERPS. How do you get to the top positions of the search results? The answer is through SEO. Will appear in one of the top positions in the Search engines results pages (SERPs) when people search for terms (keywords) related to your products or services. Will provide for a great user experience since SEO is not just about rankings but it’s also about building high quality websites. To fully optimize your business website for search engines, you need to configure or optimize a number of settings. These are related with your technical infrastructure, site structure, content and a lot of other factors. During the ranking process search engine algorithms evaluate from than 255 factors before deciding which websites will appear on the top positions of the results. For better management, these factors can be organized into 3 groups: technical, on-page and off-page SEO factors. Technical SEO can help you optimize your website for the crawling and indexing phase. It’s a crucial process that will ensure that search engines can access, read and index your content without any problems. On page SEO is what needs to be done within your website so that search engines can get a better understanding on what is you are trying to promote in their index. In other words, it’s the stage to tell search engines for which keywords or search terms you want your website to appear in the results. Off page SEO is about promoting your business online so that search engines are convinced that your website deserves one of the top places in their search results. This is also referred to as link building. Pro Tip: If you are a beginner to SEO, it is highly recommended to read our SEO Basics Guide and SEO for new websites. What to expect from a successful SEO Campaign? If you are already using SEO and you are not getting ALL the above benefits, then it means that you need to go back to the drawing board and re-think about your SEO strategy. SEO is not a theoretical concept but it’s a digital marketing channel that can produce real measurable results. If you are not getting any results i.e. organic traffic from search engines, then this is a big signal that you are doing something wrong. SEO is suitable for all businesses regardless of the size, location or language. You might be thinking that your big brand competitors are spending thousands on SEO per month and this is something you cannot afford but that should not stop you from starting with SEO. Billions of people all over the World are using the Internet to make business and no website or niche is too small to participate and benefit from this. You should consider SEO as a long-term investment and something that will keep your business going for years to come. It is true that SEO is not the fastest way to get traffic to your website. It takes time to work but when it does, is creates a higher ROI than any other digital marketing channel. If you are in a situation that you need to get search engine traffic as fast as possible, try PPC advertising or experiment with Facebook ads. But, whatever you decide, make sure that you allocate a good portion of your marketing budget on SEO. As a digital marketing manager, I have talked with hundreds of small business owners and once I explain to them how SEO can help their business, they all regret for not allocating some of the budget on SEO earlier. Spending all your budget on Ads and paid promotions may generate results in the short term but once you stop spending, traffic and sales drop. With SEO it’s the opposite. You invest in the beginning and get a lower return but in the long run the results are long lasting and continues. Pro Tip: SEO is one of the components of search engine marketing. 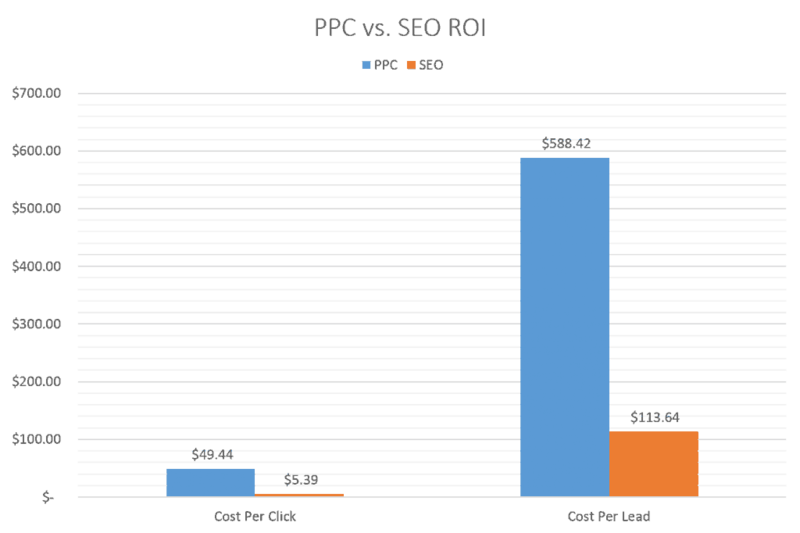 PPC is another way to get search engine traffic faster than SEO. 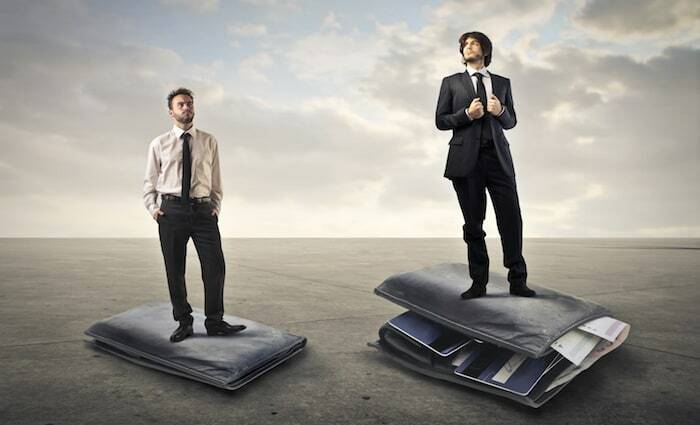 Read SEM Vs SEO for the differences. Local SEO is another term that is closely related with small businesses. In simple terms, Local SEO refers to a number of factors you can use to optimize your website for location aware searches. The same happens when a user is searching from mobile. Google knows the location of the user and adjusts the results to show businesses that are closer to the user. What does this mean for small business owners? More customers to your door. If you have a local presence and want to get customers to your brick and mortar store, you need to optimize your website for Local SEO. The most important local ranking factors are summarized below. As a startup or small business, the main goal of your online presence is to make it easier for people to find you on the Internet and Google My Business does exactly that. It’s easy to setup – You don’t need special knowledge to set up your account. Great for local SEO – Google will show your business in the search results. 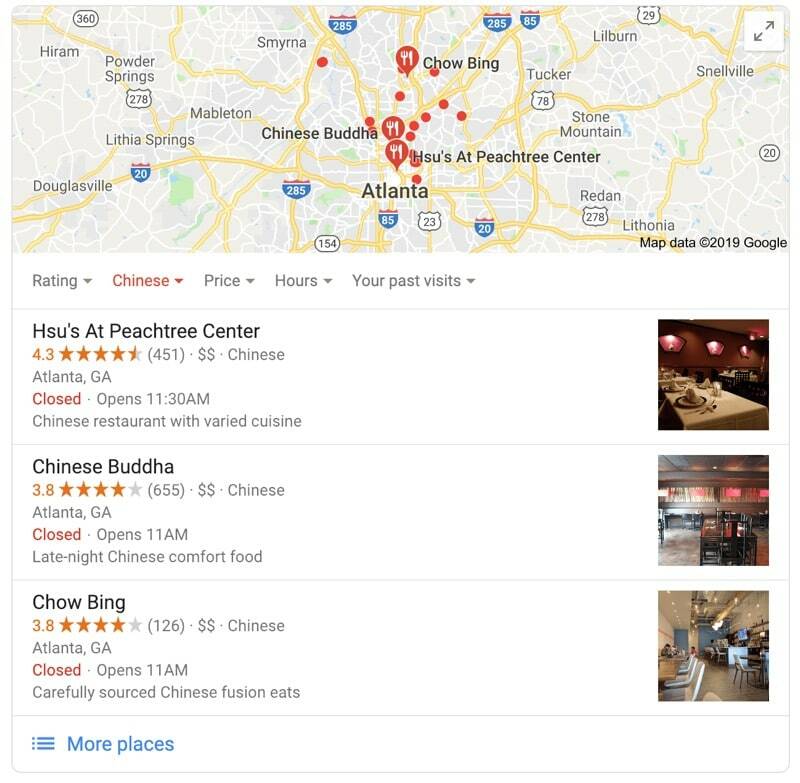 For example, if you own a restaurant in Atlanta and have already added the restaurant in Google Places, it will be shown like this (see image above) when there is a related query about ‘Chinese restaurants in Atlanta’. Great even when you don’t have a website for your business – Users can find out where your business is located, how to contact you etc. without visiting your website. Info is used by Google Maps as well – Google Maps is the most popular mapping software on the web and mobile (both iPhone and Android) and by adding your company in Google My Business, it can also be found on Google maps as well. Interact with your customers – Customers may add a review about your products or services and as a verified business owner you can respond back. You company name, address and phone number (NAP), should be visible to all website pages (preferably in your header and footer). This helps Google associate your business with specific locations. Structured data is a way to give more information to search engines about your local business. Structured data is added to the HTML code of the page or via a script. Pro Tip: Read this guide from Google, for more information on structured data markup. Having a listing in trusted local directories can improve your ranking for local searches. Having real reviews on trusted platforms like Google My Business, Facebook or Yelp, help a lot when it comes to Local SEO. Make sure that you give incentives to your customers to write a review and that you reply to every single review (both good and bad). Pro Tip: For a complete list of all the important Local SEO ranking factors, read: Local SEO checklist. You don’t have to be an expert to do SEO on your own. You have to be willing to allocate the necessary time and effort to learn SEO. If you asked me this question 5 years ago, I would have said no but today with the plethora of SEO training courses available, it’s easy to get started. 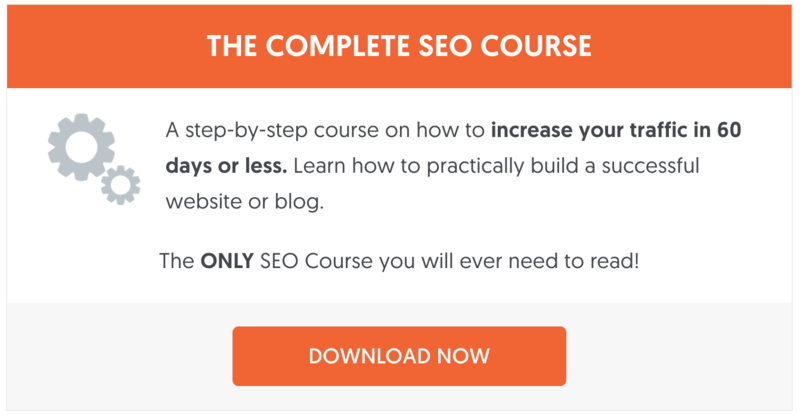 If you want to give it a try, you can start with our own SEO training bundle. It’s a low-cost solution that will teach you everything you need to know about small business SEO. We’ve been selling this course for years and our clients had great results with it. The added benefit of trying to do SEO yourself is that even if you don’t manage to get the results you want, you will be more educated to choose an SEO provider. You will get to know from first-hand the difficulties and challenges encounter in the process and this will allow you to make better decisions later. If you don’t have the available time to work on SEO or you want to assign this task to professionals that have done this before, the best approach is to hire a reliable SEO agency. Try searching Google for ‘seo packages for small businesses’ and you will get a bunch of ads and tens of possible companies to choose from. Hiring the right SEO company is important because you don’t want to spend your money or risk the future of your business. Although SEO is a relatively new discipline, there are some companies that operate in the industry for years. This means that they have the necessary experience to do SEO for a small business and you can take advantage of this. You don’t want to hand-over your SEO to companies or consultants who are still experimenting with what works for SEO and what doesn’t. Ask for case studies and success stories. This will help you get a better understanding on what they can do for your business. If they have done it before, there is a greater chance to do it again and grow your business. Ask them to outline their SEO strategy and lay out an action plan for the next 3 months. Make sure that it is clear how they plan to increase your rankings and traffic. How do they plan to track the progress of their SEO campaigns? Do they provide monthly reports and what are the expectations in terms of results for the next 3-6 months? Are they making promises that are too good to be true? I mentioned above that SEO times to work and while this is true, committing to a long-term contract with any company is not the best approach. Companies that have confidence in their services don’t require long term commitments. Better sign-up with a company on a month-by-month contract so that you can stop anytime without penalties. SEO is not necessary an expensive service despite what some people think. It depends who you hire, the current state of your website, competition, types of products or services you are selling and a lot of other factors. If you choose to hire a small but flexible SEO firm you can get great results with less than $1000 per month. If on the other hand you choose to pay for hiring big brand, you will pay more for the brand name without any real added benefit. To give you an idea of how SEO works for a small business, here is a list of practical SEO tips to help you get started. Assuming that you already have a website, the first step is to register with Google and Bing webmaster tools and submit your sitemap. Why? It’s the best way to inform search engines about your website and future content updates and also, it’s a great way to find out how your website is performing in search. While Google search console can give you information from a search engines view, Google Analytics can give you more information from the user’s view. It is necessary to understand how users interact with your website so as to improve the quality of your content and offer them a better user experience. This is SEO 101 but it is very important to have a proper title (and description) on your home page. Your homepage title besides your brand name, should also include keywords that users are familiar with, related to the type of products or services you are selling. Your description should accurately describe your business and give an insight to help users understand what to expect from your website even before visiting. Having a properly optimized site structure is very important. A good structure should make it easy for search engines to index your content and for users to find out what they want in less than 3 clicks. Many small business owners tend to give more preference on how the website will look but having a proper structure is far more important. Pro Tip: Read Best site structure for SEO to learn how to optimize your website’s pages and categories in a way that is meaningful for both search engines and users. As a startup or small business owner, you probably need to rank on Google for terms (keywords) related to your business. In other words, unlike a content driven website or big ecommerce store you have a narrower audience. One of the ways to let the search engines understand for which keywords you want to rank for, is to use these keywords as the anchor text in your internal links. For example, if you have a law firm and one of your pages describes your services, then from your home page you can link to that page by saying: ‘You can find out more about our legal services and….’ Legal services in this case is the anchor text of the link that goes to the services page. This gives a strong clue to search engines that the referenced page is about legal services. Think for a moment the purpose of having a business website. Besides Internet exposure, what are your objectives? When visitors enter your website, what do you want them to do? Fill out an order form? Answering the above questions will give you a good idea on how to design your website for better conversions. For example, if your goal is to get visitors to your ‘services pages’ then you should make sure that there is a clearly labeled link in your menu that is always visible (like our top menu), and that you have links on your homepage and footer. Forget about the traditional marketing funnel but concentrate on how to best serve your potential customers intent at every step of the funnel. Customers are constantly looking for information before they buy a product or service and you need to be there when they do. Spend some time researching your competitors and make use of tools like SEMRUSH and Google Trends to understand who your customers are and what words they use to find a product or service. Take those keywords and analyze what steps they take before and after making those searches and make sure that you have high quality content on your website that provides answers to what they want. This is the modern way to build awareness and trust that will eventually lead to sales. Branding is important for the success of a business and it’s also important for SEO. If a lot of people are searching for your brand name on Google, this is a good SEO signal and it is taken into account by Google during the ranking process. Try to promote your brand in any way you can. Utilize Facebook Ads, Instagram paid campaigns and other social networks relevant to your business. Monitor for brand mentions on the web and make sure that your reputation is not damaged by fake comments or unhappy customers. If you decide to do SEO on your own, you will need to get familiar with tools at some point. Even if you hire an SEO firm to do SEO for your business, it’s always good to know how to use tools to monitor your rankings and traffic, spy on your competitors and have a clear understanding of how your website is performing on the Internet. SEMRUSH – This is by far my favorite SEM Tool. You can use SEMRUSH to analyze your rankings, perform keyword research, spy on your competitors, find new link opportunities, monitor brand mentions across the Internet and a lot of more useful functions. It’s not free, it comes with a monthly subscription but it’s money well spent. Google Search Console – A free tool provided by Google for webmasters. You can use the various functions and reports to monitor how your website is performing in Google. Google Analytics – Get a deep understanding on how users interact with your website. Bing Webmaster tools – Similar to Google search console by for Bing. Google Trends – You can use it to find out the popular searches in your niche and deliver the right content and products to your customers. Google My Business – A free tool by Google for small business. Among other things, with Google My Business you can optimize your profile when people are searching for your business name on Google. SEO is an important tool for every small business who wants to compete online, regardless of the size, language or region. SEO can help you get more customers, promote your brand and help your business grow faster than any other marketing technique. SEO is not hard but it takes time to work so you need to be patient. You can approach SEO by taking a DIY SEO Course or by hiring a trusted SEO firm to handle SEO for you without spending a fortune. It is a fact that if you do it correctly, SEO can be the best investment you will ever made for your small business. Thanks for commenting. All the best with your small business SEO efforts! Alex, A very detailed article. Thank you very much for writing in depth with links. Semrush and google search console has been something we really want to invest our time in. The new version is completely confusing for us, what’s your thought on it Alex! That’s true. A lot of webmasters complain that the new version of Google search console is more confusing than the old one but once you get used to it, it’s better. The reports have more helpful and accurate data. We plan to publish new tutorials on how to take advantage of the new reports and tools soon, so stay tuned.